TAYplan, one of Scotland’s four Strategic Development Planning authorities, have been doing some interesting work in recent years. Their latest Strategic Development Plan for Dundee, Perth, Angus and north Fife won the Royal Town Planning Institute’s top award last year, the Silver Jubilee Cup; not bad for a plan that was produced on a tight budget with a core team of just 3 staff, up against planning projects from all over the UK. They’ve also been pioneering new ways of communicating strategic planning, conventionally seen as a rather abstract concept, such as using online video and graphic leaflets. Gain an insight into young people’s aspirations and concerns for the future, to feed into preparation of the Main Issues Report. Generate interest and enthusiasm amongst local schools and youth councils (where they exist) for further engagement with planning in the future. Build capacity amongst planners in TAYplan and partner authorities to undertake further engagement with young people when the Main Issues Report is published in 2014. 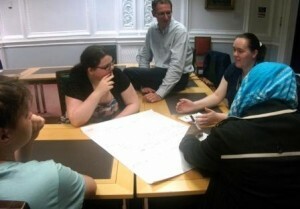 Develop new ways of engaging young people in strategic development planning.